Make the most of the short crab apple season with this delicious, simple preserve recipe. Wash the apples, remove the blossom heads and cut out any bruised bits. Put in a large preserving pan, fill with water to cover the apples and bring to the boil. Simmer for 25 minutes until the fruit is soft. Carefully pour the hot pulp into a jelly bag or several layers of muslin and leave to drip through overnight into a clean pan beneath. Don’t squeeze the bag, it will cloud the jelly. The next day, measure the juice, and combine with the sugar at the ratio of 10 parts juice to 7 parts sugar (eg. 100g juice will require 70g sugar). Add the lemon, then bring to the boil to dissolve the sugar. Keep at a rolling boil for 35–40 minutes, skimming off the froth regularly. To test, chill a spoonful of jelly in the fridge for a few minutes. It is ready when it forms a skin on the surface. 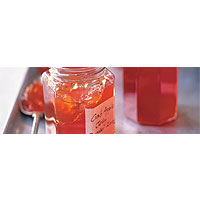 Pour into warm, sterilised preserving jars and tightly seal while still slightly warm. Store in a cool dark place. This recipe was first published in Sun Apr 01 01:00:00 BST 2007.